You don’t have to be Indiana Jones to be an adventurer – just about anyone can embark on an eating adventure. Sometimes the adventure can be eating something you wouldn’t normally consider food. Sometimes the adventure can be stumbling upon a bizarrely out-of-place dish. And sometimes the adventure can be catching your own food. Here are four more amazing dishes from around the world to tantalise your sense of adventure. Brought to you by three amazing travel bloggers, Raymond from Man On The Lam, Laura from A Wandering Sole, Amy from Livin On The Road (who always eats street food because she lives `on the road’) and yours truly, who ate ant soup especially for this food festival. Enjoy day six of the first-ever online International Street Food Festival here on The Dropout Diaries! French fries. Gravy. Cheese curds. Alone they are nothing special, but something magical happens when you combine those three ingredients in one ooey, gooey, steaming mess. The gravy snakes through the cheese, the cheese hugs the fries, and the entire concoction makes love to your tummy. 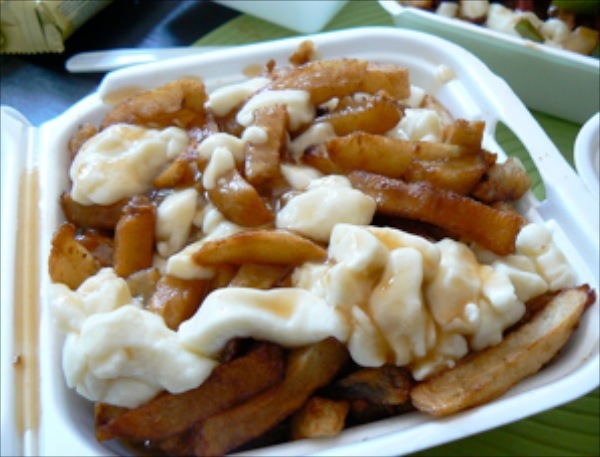 It’s the ménage-a-trois they call poutine – a French-Canadian staple – and for better or for worse, it’s now available on the streets of Bangkok. Poutine is comfort food at its most comfortable. It’s messy, it’s fatty (and fattening) and it will have you longing for more. And for more comfortable pants. Raymond believes the best travel companion is a good sense of humour, so he focuses on the upbeat and offbeat side of travel. He abandoned his cubicle-shaped cell and now his goal is to inspire others to “shake the shackles and escape through travel” through his blog. Just because you can’t see the path ahead doesn’t mean that it’s not there. Take a chance. It’s a heckuva lot more interesting than staying put. – Raymond’s advice for people who have a dream but are a bit scared to jump into it. In total, I’ve spent nearly a year in countries in East and Southern Africa. I will be the first to say that the food is fairly bland in these regions. I grew accustomed to eating maize, rice, beans, pumpkin, kale, and cabbage. A banana, mango, or avocado was a treat. In 2010, I was transiting in Zambia and made an overnight stop in Lusaka. I met a nice businessman at my hostel who offered to drive me to Livingstone (rather than having to take the bus) if I could wait until the afternoon when his meetings ended. I now had a morning to kill in Lusaka and decided to seek out and wander around a local market. I grew hungry and had found the area of the market where women were cooking local dishes. I saw a vendor with a warm smile and popped in. She was making several dishes, none of which I recognized. I asked her to serve me a dish of her choice. I chose to have it served on rice rather than the traditional African dish, known as nshima in the Zambian language (which is just cooked maize flour and water). I was pleasantly surprised when I took my first bite — it had a nice flavor. I couldn’t quite put my finger on the taste though. It turns out that it was a peanut sauce with pumpkin leaves, onions, and tomatoes. 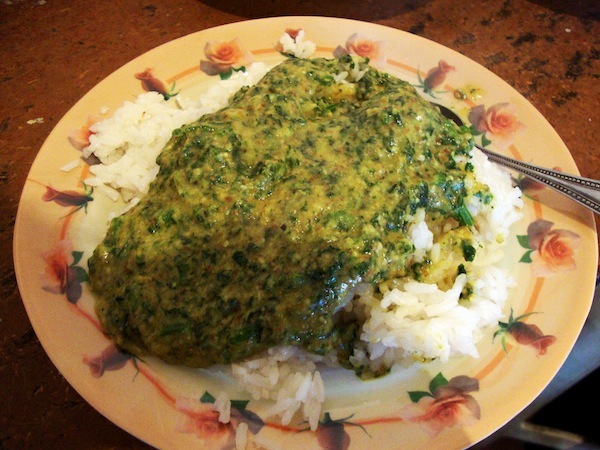 I had never heard of cooking with pumpkin leaves before eating this dish. Laura is a traveler, volunteer and Africa enthusiast always dreaming of her next adventure. Barbecues have been considered typical Australian fare ever since Paul Hogan (aka Crocodile Dundee) told Americans he’d “slip an extra shrimp on the barbie” for them in a 1980s tourism campaign. We love barbecues and cooking on a campfire so much that we actually carry both a barbecue and a cast iron pot on our travels around Australia. There’s something so relaxing about cooking outside in the great outdoors. Barbecue food can be cobs of corn wrapped in foil and eaten with salt and pepper, or the usual meat that we serve with a salad. The meat is often sausages, hamburgers or steak, though we have barbecued freshly-caught fish too. On Christmas Day, after we swam with the dolphins, we realised our new friends were herding salmon towards the beach. We managed to catch some for a fabulous Aussie Christmas Day barbecue dinner. We love having a campfire in winter. We use our cast iron pot for slow cooking. We chop up carrots, potatoes and onions, and add beef or sausages to make a stew or a casserole. We then add gravy. The casserole has a delicious smoky flavour, and the meat is so soft it just seems to melt in our mouths. It’s a delicious way to end a day in the Aussie outback. Amy is a pharmacist and naturopath who is traveling around Australia in a camper van with her electrician husband and four kids, aged three to 10. Night markets all over Chiang Mai offer insects for sale. At first I thought all the fried bugs, crickets and worms were just a novelty for tourists. But it seems insects really are by locals here in northern Thailand as a cheap and cheery source of protein. Right now, tender new pak waan leaves are in season, available at roadside stalls and in wet markets all around the city. 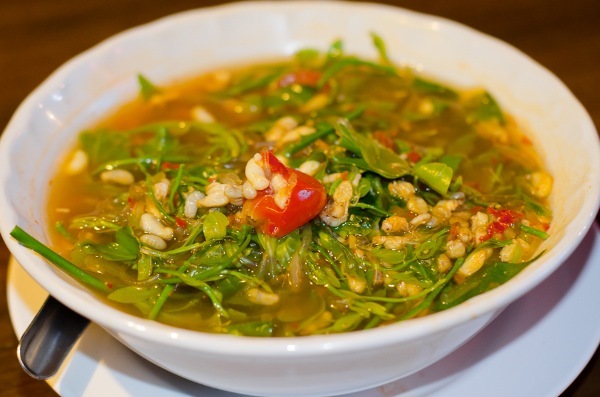 Pak waan leaves are considered best eaten with ant eggs. 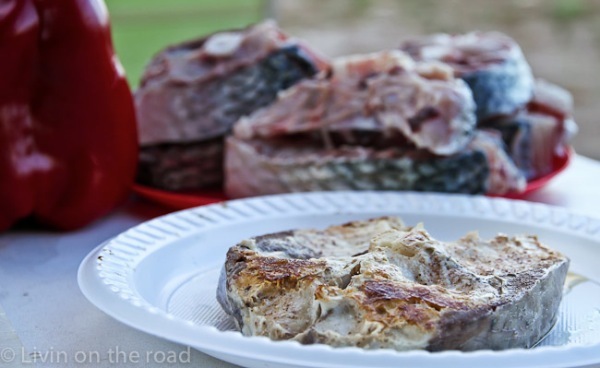 So what better time to try a local Chiang Mai specialty? Not game to try to cook up some insects ourselves, we gathered an insect-eating entourage and headed to a sit-down restaurant to sample the northern Thai street food specialty of ant soup, otherwise known as Kang Pak Waan Kai Mod – pak waan leaf soup with common red ant eggs. 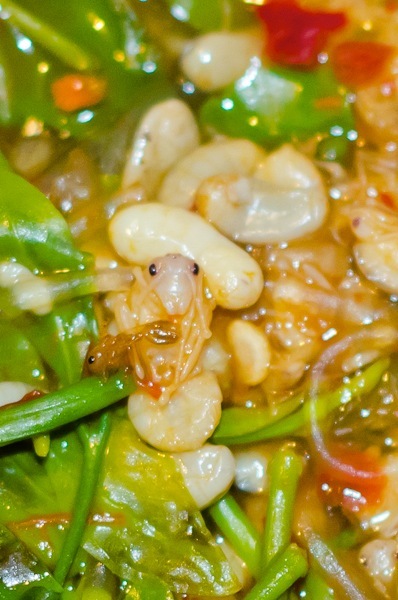 The soup contains ant eggs and baby ants. And the ants are quite large. It was a mental challenge actually getting one of the ants into my mouth and chewing on it. The verdict: not so bad. The soup had a bit of a pineapple tang to it, a bit of a chilli tingle and lots of slippery rice noodles. The ant eggs had the texture of tiny baked beans and barely any taste. But getting an ant leg stuck between my teeth was an icky reminder that I was eating an insect. Read: A Fortune Teller Told Me by Tiziano Terzani. An engaging true-life story written by a Western journalist who decides to heed a fortune teller’s advice not to fly in 1993. Terzani managed to fulfill his duties as a Southeast Asian correspondent and travel back to Europe to visit his mother using “earthbound” travels. A great armchair-travel read. 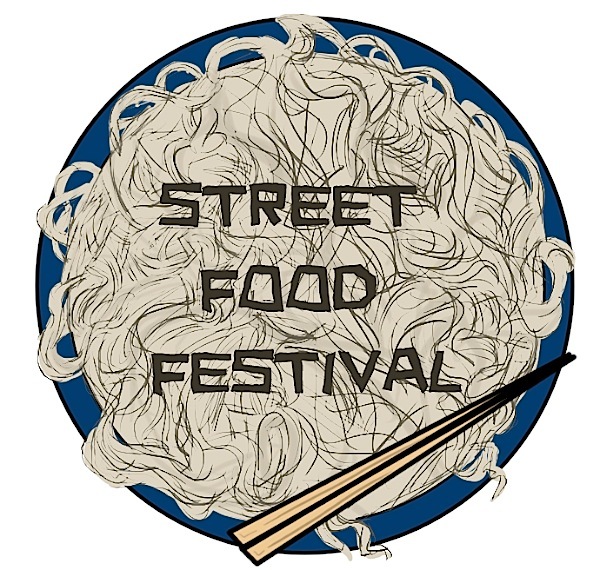 Stay tuned for day seven of the International Street Food Festival tomorrow, featuring four fantastic Latin American dishes brought to you by some truly great globetrotting bloggers, including a traveling mum (well, she’s American so she’s actually a mom) who rode a bicycle across the Americas. A career girl who dropped out, traveled, found love, and never got around to going home again. Currently on a year-long World School adventure with my two kids, seeing what this wonderful world can teach us. 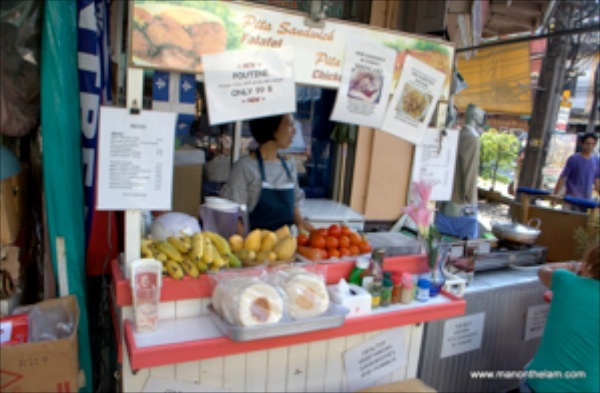 I am coming to Thailand in a couple of weeks and I can’t wait for my eating adventure to start! I just hope I’m as enthusiastic about the exercise I’ll need to do to stop my wasit expanding, although some how I doubt it! Some people are so much more adventurous than I! Thanks for including us! Ant soup?!! It looked okay until the close-up photo. Definitely has the ick-factor. I had a bit of time to get used to the idea before I saw the ants in close up. And, to be honest, I only gave it a try after our French houseguest did. He is much braver than me! Like might be too strong a word, Raymond. The soup itself was quite tasty. The ants in it were not so offensive. But they were still ants.